Weight vs. Cubic Feet Moving Estimates - Which is better? Honestly, it doesn’t really matter, but understanding how each measurement system works can keep you from getting overcharged. We get this question a lot. Which type of estimate should I trust? Weight or cubic feet based? Customers are usually caught in the middle of two moving company salespeople. One claiming weight based estimates are a scam. The other claiming cubic footage based estimates are a scam. Guess what, it doesn’t matter which type of estimate you get. A scammy moving company will find ways to overcharge you regardless of whether your estimate is weight or cubic footage based. Like we always say, your focus should be on hiring a reputable moving company! And yes, we made a list of the most reputable nationwide moving companies. Back to the point, a good mover will make sure the move is properly quoted and make you aware of any scenarios where your moving estimate could increase. Most customers are getting a binding estimate anyway and in that case, the weight vs cubes issue truly doesn’t matter. If you’re getting a Binding Estimate you’ll want to pay closer attention to the items list (aka “Table of Measurements” or “Cube Sheet”). Your binding price is based on the actual number of items you have, not on the total cubic feet or weight. So if you have 250 items listed on your “Cube Sheet” and end up having 300 items on moving day, your price will likely be increased regardless of weight or cubic footage. Again, a good mover will set the estimate up correctly so that moving day doesn’t have any hidden surprises. You should still understand the difference between the two types move size measurements, so let’s take a look at both. Quoting moves in terms of weight is the industry standard and you’ll see most major van lines will by default offer weight based quotes. The major benefit to weight based estimates is they can be verified by the Department of Transportation (DOT). If you’re confused by how they actually weigh all your stuff, let me explain. The truck is weighed prior to loading. Then after everything is loaded they reweigh the truck. The difference between the two is the weight of your move. And since the DOT does the weighing, you have a trustworthy 3rd party to verify the weights. This is especially nice because if you do have a discrepancy with your mover you can request the DOT certified weight tickets to verify everything. But like I mentioned earlier, shady movers can take advantage of the weighing system. Loading other moves before weighing, filling up the gas tank, and forging weight tickets are common scams if you hire a shady mover. Cubic footage estimates are perfectly legal but are generally frowned upon because they can’t be verified by the DOT. We also see scammy movers often quoting in terms of cubic feet because it’s easier to game. Packing the truck poorly or generous measurements can quickly add to the total cubic footage of a move. But some of the best movers we work with provide quotes in terms of cubic footage with no problems. As a general rule of thumb, if you haven’t worked with the mover before or weren’t referred by a trusted party then it’s best to avoid cubic footage estimates. And again, hire a good mover and you won’t need to worry too much about this. Learn more about the different types of moving estimates. How do movers weigh the moving truck? Why do moving companies estimate different weights? What’s The Average Cost Of Utilities? What is a moving company shuttle fee? Which type of moving estimate is the best? Cheapest way to ship one bedroom cross country? 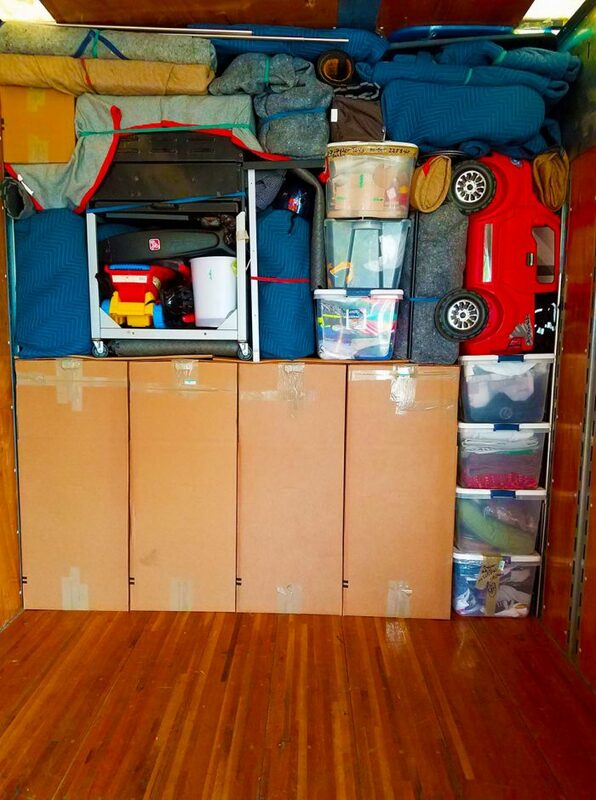 Can you share moving truck space? Will Moving Companies Ship My Car & Furniture Together? What is the cheapest way to move cross country? What is the cheapest way to ship 20-30 moving boxes?